Every year, there is a considerable amount of children that are bought in emergency rooms due to accidents in playgrounds and playground equipment. From the reported estimation of 200,000 in the United States alone, 15 of these are fatal. Most of the injuries are a result of falls from equipment. With this, safety should be the topmost concern for those who are looking to build a playground. This is especially important parents who intend to build one right in their own backyards as there is less supervision and compliance to regulations that are designed to prefent these common injury issues. Purchasing from an authorized retailer of Juvenile Association approved manufacturers can ensure that you are using the safest, sturdiest and most carefully designed materials. Since more than half of play-ground related injuries are caused by falls to the ground, it is important that protective surfacing should be used under and around all the playground equipment to reduce any risks of serious head injuries and even death. Playground equipment should never be placed over asphalt and concrete. Grass and turf can lose their ability to absorb shock overtime so it would be best to just use protective surfacing for long term durability and safety. There are loose-fill surfacing materials that have proven to adequately absorb shock in cases of falls from playground equipment. These are double shredded bark mulch, wood chips, fine sand, and ultra fine gravel. There are also manufactured synthetic surfaces available. However it should be assured that such synthetic material has been tested on its shock absorbing performance. TheGorilla Playsets Rubber Mulch for Play Areas - Swing Sets and Play Sets would be a very good material to cushion children from falls. This is virtually maintenance-free and has been tested in both resiliency and longevity. 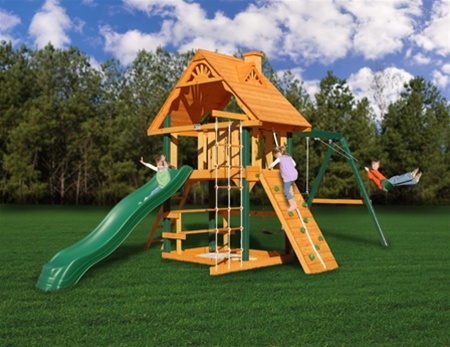 Plus, it comes in five colors to give the playground a refreshing break from all the bland and unattractive colors of typical surfacing materials and add to the ultimate design of your backyard play area. A use zone is an area that is covered with protective surfacing material which should cushion a child in the event of falls. This should be placed under and around equipment that a child is more likely to fall. It should also be made sure that there are no obstacles on such zones that will impede a safe fall. Stationary climbing equipment and slides should have use zones that extend to at least 6 inches from the perimeter of the equipment. Swings should also have the same allowance on the outer edge of its support structure. In the front and back of the swing, the use zone should extend at least twice the height of the swing, measuring from the ground to the swing hangers. Properly spacing the swings as well as their support structures will prevent injuries upon impact. Swings should be at least 8 inches between suspended swings and between a swing and the support frame. They should also be at least 16 inches from the swing support frame to a pendulum see-saw. The ground and the underside of a swing should have a minimum clearance of 8 inches. It should be ensured that swing sets are properly and securely anchored. Platforms that are elevated at a height of at least 30 inches above the ground should have guardrails to prevent falls. Gorilla playsets and other manufactured systems are designed to meet these and other codes that are tested, tired and true, so that nothing is missed by the well intentioned parent. Openings that are closed on all of its sides should have a diameter that measures less than 3 ½ inches or greater than 9 inches. Openings that are between 3 ½ and 9 inches pose a head entrapment hazard. This is because such openings are large enough for a body to go through and yet are too small to accommodate the head. In such instances, there is a risk for the child to be entrapped by the head where serious injuries can then occur. “S” hooks, very common among swings, can act as a hook or catch point once opened. The protrusion of such equipment can entangle with the child’s clothing and potentially cause serious injury. Therefore, it should be ensured that they are closed as tightly as possible. This factor comes early on in the selection of the equipment to place in a playground. Make sure that there are no exposed moving parts that present a pinching or crushing hazard. Should a piece of equipment have one, ensure that it has adequate covering to keep the child out of harm’s way. Many safety conscious manufactured playground sets include at least options for foam covers for these areas. It is important not to skimp when including these last touches of installation. Playgrounds need to be inspected on a regular basis. Its protective surfacing should still follow the recommended depth, especially when mulch is used. Over time, the surface covering material will get shifted and it is important there is always a soft landing especially around ladders and swings. Any element that has not followed with the safety standards any longer should be removed, corrected, or repaired as soon as possible to prevent injuries. Do the necessary interventions for loose or worn hardware, particularly those that already have protrusions or projections. Also check on the ropes and corded items with regards to their placement as it can cause the strangulation of the child if left in an area where falls could occur or long enough to be a hazard. Also check for exposed equipment footings; scattered debris, rocks, and tree roots; rust and chipped paint on metal components; splinters, cracks, and decayed wood components, deterioration and corrosion, or missing damaged parts. Most importantly, children should be supervised or taught with safe play. They should be taught of the potential hazards of walking and playing near moving swings as well as tying ropes to playground equipment. Playgrounds are very helpful areas for children to fully use and hone their knowledge and skills to their full potential, making them very good avenues for growth and development. Just like all things, it has its own set of rules and regulatoins that should be followed in order to ensure fun and safe play for many afternoons.